Interschutz 2010, the largest International Exhibition for Rescue, Fire Prevention, Disaster Relief, Safety and Security, held in Leipzig – Germany, has come to a close until the next venue in 5 years time. FirePro participated with success, attracting many visitors whom we would like to thank. FirePro succeeded in meeting new business acquaintances and associates, especially, companies to represent FirePro in new countries/territories, thus expanding the FirePro brand further worldwide. New interests included Japan, Peru, Colombia, France, Serbia, Lithuania, Germany, Switzerland, Finland, Czech Republic, Estonia and Lebanon. 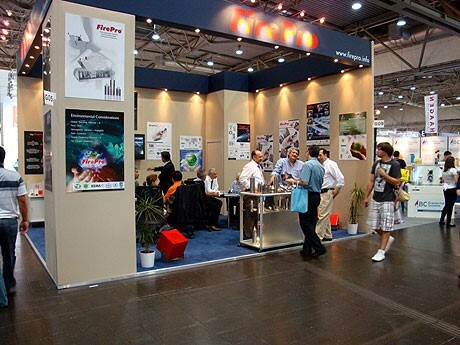 During the exhibition FirePro was also visited by many of its global Dealers, and was assisted in particular by its associates from Holland, Brazil, Argentina, Spain, Turkey and Italy, to whom we would also like to express our sincere appreciation and thanks. Currently, FirePro enjoys representation and presence in over 70 countries worldwide.